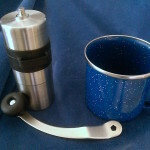 Another of my favorite simple tools is the Porlex Mini Stainless Steel Coffee Grinder. I bought it a year ago to go with the Bodum Personal French Press that I reviewed a few days ago. I’ve used it enough now to have figured out how to use the tool. The design is clean and simple. It’s a bean bowl (top) below which is housed the grinder (ceramic burrs) and a catch bucket at the bottom. The catch slides off the body of the grinder so you can dump freshly ground coffee into the brewer. (I use a French press for now.) A stainless steel handle connects to the mechanism via a pentalobed nut. Once beans are loaded into the hopper, the “wrench” is slipped over the nut and then grind away. It takes me a couple of minutes to grind a serving of coffee while the pot is on to boil. The handle is long enough to provide sufficient leverage for easy grinding. Setting the grind is a bit “fiddly.” (I love that British colloquialism!) Once set, the grind has been consistent for me (so far). I have no idea how long the unit might last in daily use, but I’m going to find out. There is a strong “rubber band” with a slot to hold the handle when not in use. The unit fits easily into my travel kit. I much prefer to buy beans and grind my coffee on demand. The burr-type grinders produce a better grind than the “chopping” machines. (I had one of those and gave it away.) Ceramic burrs last longer than steel (so I’m told). I like this unit. The design is simple, clean, and there aren’t many moving parts. 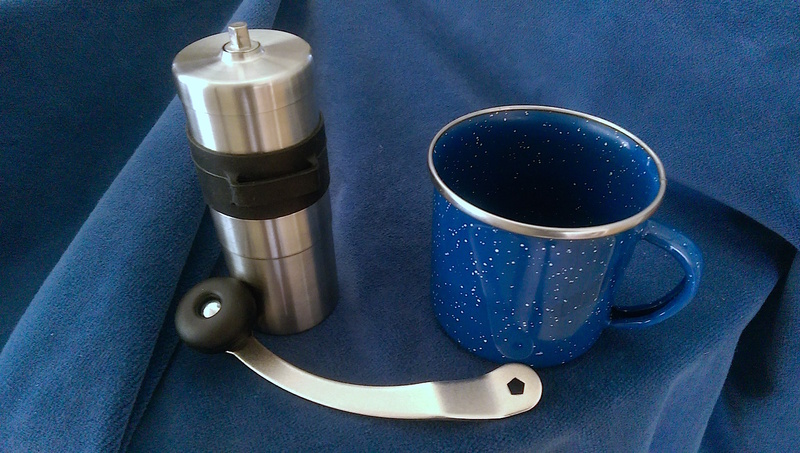 It’s small, compact with the removable handle, and there is enough leverage to easily grind coffee. As I said, I like this unit.